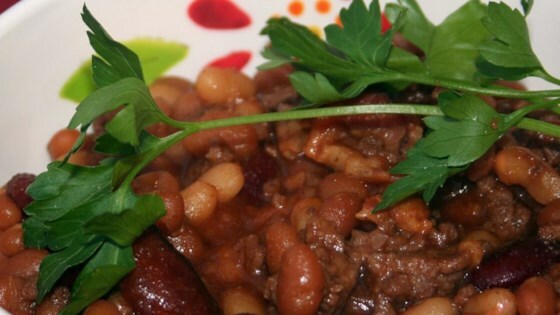 "Sweet barbeque beans loaded with bacon and ground beef and a surprisingly sweet flavor. The taste of these beans is to die for!" Fry the bacon pieces in a large skillet until browned and crisp, remove from the pan and set aside. Crumble the ground beef into the pan; cook and stir until no longer pink, then drain off grease. Transfer the ground beef and bacon to a slow cooker. Pour the baked beans, navy beans, kidney beans, ketchup, brown sugar and vinegar into the slow cooker. Season with honey garlic sauce, sweet and sour sauce, onion powder, garlic salt, mustard powder and Worcestershire sauce. Stir until everything is distributed evenly. Cover, and cook on High heat for 1 hour before serving. Sweet and spicy, with lots of ground beef. These ain’t your basic baked beans. This sounds so good and hate to sound dumb but what is honey garlic sauce? Great recipe. I cooked the bacon first, removed then cooked the ground beef right after. Then drained. I also added a jalapeno to it..........it was great!! !